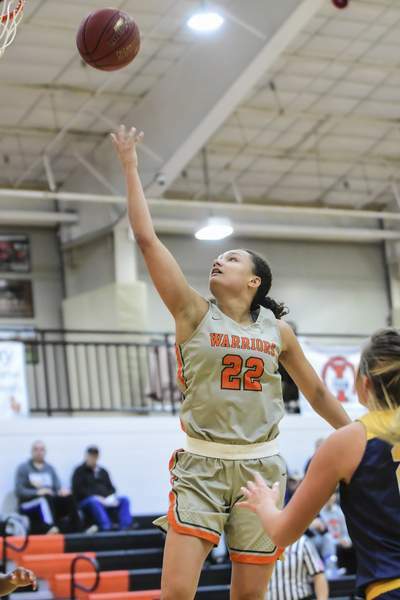 Mike Moore | The Journal Gazette Indiana Tech sophomore guard Alexis Hill led the way with 23 points for the Warriors in Wednesday's win over Siena Heights at the Schaefer Center. It didn't come as easily, quickly or via the usual scorers, but the No. 3 Indiana Tech women's basketball team got the job done Wednesday night to notch its 17th consecutive win, a 65-55 decision over Siena Heights at the Schaefer Center. “It's an amazing feeling; there's nothing you can really say to describe it,” DeAnn Kauffman said. Many games this season for the Warriors (18-1, 10-0 WHAC) have been over by halftime as they have a 24-point average victory margin. And many of those victories have been led by forward Kendall Knapke, the team's top scorer. But Siena Heights (14-5, 7-3 WHAC) held Knapke and second-leading scorer Kauffman to a combined 14 points. That didn't change the outcome as sophomore guard Alexis Hill stepped up, scoring 23 points. Hill spent the evening putting her head down and getting to the rim with ease. The Warriors led 33-22 at halftime, but by the looks on Biggs' face and shooting 35.7 percent, it seemed as if they were on the losing end. Tech picked up the energy in the third quarter, and the Warriors' transition game overwhelmed Siena Heights. Kauffman found a cutting Hill for an easy layup to go up 37-22 two minutes into the second half. “I think they came physical and we weren't prepared, but in the third and fourth quarter we were ready to battle with them,” Hill said. Siena Heights' Addyson Tomczak nailed a 3-pointer and Kiana Votava converted an easy layup to cut Tech's lead to 37-30 with 5:48 left in the third quarter, forcing Biggs to call a timeout. Tech's lead was just six heading into the final frame. Strong defense and some timely free throws held off the Saints in the fourth. Rachel Bell went 4 of 6 from the floor, hit all six of her free-throw attempts and scored 14 points for the Warriors. Biggs said a competitive game like this can help the team down the line, especially when the postseason comes around. “Any time you can get some of those scenarios and get live-game experience, and we need to play against live-game competition, and still get a win, that's a bonus,” she said. Note: The Warriors' No. 3 ranking is the highest NAIA Top 25 ranking since the 1991-92 season.